Chris Gayle strengthened his credentials as the most destructive batsman in world cricket with a dominating display in the West Indies’ thumping win over England in Mumbai. The 36-year-old put on a masterclass in his side’s opening 2016 World Twenty20 matchup to give them a perfect start to the tournament. Gayle came into the competition having not played in an international T20 fixture in over a year, but did not miss a beat despite a slow start to his innings. The opener displayed his experience and poise, showing how to play without fear, at the crease and did not panic after facing just six balls in the early overs of the Windies’ run chase as Marlon Samuels dominated the strike. However, once his partner was dismissed, Gayle took the attack to England’s bowlers. He first dispatched Adil Rashid for two huge sixes over his head to send him out of the rotation. His onslaught continued against Ben Stokes, Moeen Ali and David Willey to put Darren Sammy’s men on the verge of victory. Gayle reached his century off just 47 deliveries, the third-fastest in the history of T20 internationals, as he struck 11 sixes at The Wankhede Stadium to allow his side to cruise to a six-wicket win. 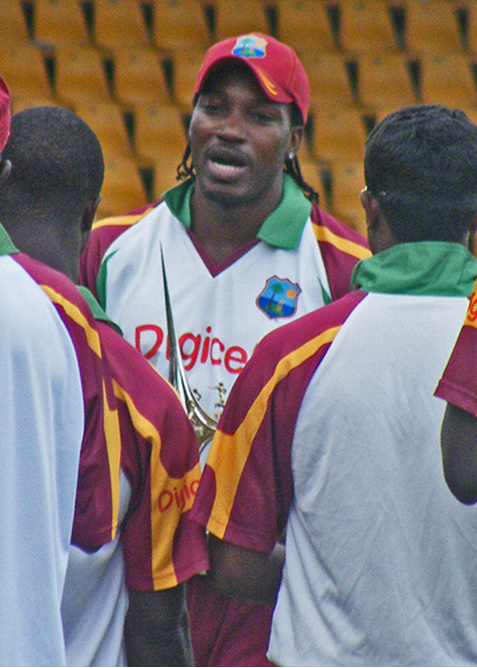 The hundred was Gayle’s first in the international format since his destruction of South Africa at the World Twenty20 in 2007, which proved to be in a losing effort. On this occasion the 36-year-old was the match-winner for the Windies, taking them a step closer to reaching the semi-finals of the competition. He has a strong history at the World T20 as he has finished in the top-five run scorers twice in the past five tournaments, notching 222 runs in his team’s march to the title in 2012. Gayle’s relaxed demeanour at the crease can make you wonder how focused he is in the middle, but when the bowler strides toward the wicket his flawless technique locks into gear. The opener has great power, but it takes more than brute force to clear the boundary with the regularity that he has shown over the course of his career. His timing and head position allow him to strike the ball better than arguably any player in the world, which is why Gayle will have his sights set on leading the run charts in the competition. The 36-year-old’s experience in the Indian Premier League and detailed knowledge of conditions will stand him good stead in his attempt to guide the Windies to their second title. Following his outstanding performance against England, he is backed at 7/2 to lead the run column. And, looking ahead at the attacks Gayle will face, there should be no fear for him to achieve the feat. Meanwhile, the oddsmakers at http://extra.bet365.com/NEWS/en/ have the West Indies at 13/2 at the time of writing to go all the way and clinch their second crown. With their maestro at the top of the innings it could become reality.